National Museum of Scotland pretty much is arguing that because Europeans genocided the Beothuk away there were no descendants to claim the skeleton so they don’t need to give it back. Hundreds of churches in the state shelter thousands of important and vulnerable pieces of sacred art. Rare Asprey & Co. mystery clock taken, adorned with sapphires, gold, and crystal. Don’t put put major stolen paintings you don’t even have online or else you’re going down for wire fraud. Paintings by artist Arthur Sussman were stolen from a storage unit. Risks in posting art on the internet: it get’s stolen. Everyone still loves these late 19th century fakes. His reps say he has permission to use the work, however he had been telling an alternative origin story for it that left out artist Oksana Zhnikrup. Caught on CCTV naked and stealing a giant black-and-white checkered swan. Stolen from the Veterans Memorial and Park in Breitung Township, Michigan. The loss of the scrap metal around the air conditioning unit at the Henry County Historical Society puts the artefacts housed inside at risk. “Rubenstein was ordered Monday to serve six months in jail, three years of probation and pay $1.1 million” to victims. He pleaded no contest to two charges of grand theft by embezzlement that relate to his bankruptcy. Assumed to be theft for scrap metal. In one piece, found thanks to an anonymous tip. Fears that the Sacramento library statue will be scrapped. Big Papi has returned, he was taken by a homeless man. Vintage guns and other WWI and WWII artefacts taken. Victim knows the suspects who are thought to have sold some of the items to buy drugs. 22 arrested from two international smuggling rings. Art theft as protest art. The battered Classic statue was found under the front seat of a car near Corinth. Looted in the 90s, smuggled to the US, no charges. Could the famously stolen and re-stolen stone head back to Perth? Poole is accused of falsely claiming to have the right to sell paintings that he didn’t own. Mostly metal Georgian artefacts were taken from Penpont Church. Shaun Greenhalgh tells all, or so he claims. MONA is starting the ticketing process over again for the event which involves a bull carcass because of a plot to disrupt it. More details of the methods used by the thieves to steal these important Maori ancestral paintings. “We are 18 years old. We needed to do something we’ve never done before,” Li said. What will new regulation do to the Indian numismatics trade? The stolen locket was dumped in a cash box either out of remorse or because investigators were zeroing in on the culprit. Whatever the value, the religious items were stolen. Exhibition is aptly titled “Return of the Three Stone Sculptures from Australia to India”. 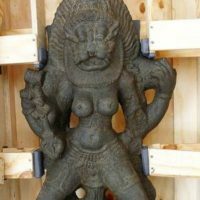 “Stolen from the Vriddhagiriswarar temple in Vriddhachalam nearly 15 years ago” and returned form the National Gallery of Australia. Trying to sell it for $4 million, had a human skeleton in it. Draft federal law is meant specifically to protect monuments and artefacts from looting. Contraband (2010) are photos from her archive of items seized at customs in the US. Not everyone likes the idea of a rock musical on the Palatine Hill. Other close advisors and cabinet members have disclosed their art holdings.